The Jacksonville Jaguars are opening up their quarterback competition. After two preseason games, including Thursday’s loss to the Buccaneers, Jaguars head coach Doug Marrone says he’s still looking for the right signal caller. 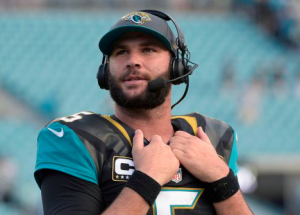 Moving forward, incumbent starter Blake Bortles will be sharing first-team reps with Chad Henne, creating an open competition between the two. Marrone’s decision to open the quarterback competition midway through the postseason comes after a poor performance from Bortles on Thursday. In two preseason games, Bortles has completed 11 of 18 passes for a mere 81 yards and no touchdowns. That’s not been good enough for Marrone, who didn’t mince words after the game about still looking for a starting quarterback. After Bortles struggled, Henne played two drives with the first-team offense. He was 6 for 10 for 44 yards in that time. He wasn’t overly impressive either, but the veteran may have enough NFL experience to prove to Marrone that he’s the best option. Bortles has been the starter in Jacksonville for more than two and a half years, taking over early in his rookie season in 2014. He’s committed the most turnovers in the NFL in that time. Bortles has also won just 11 of his 45 starts. Now for the first time, his starting spot is in serious jeopardy. But he says that’s not going to change his outlook. Marrone has also acknowledged that third-string quarterback Brandon Allen is also an option. Allen was 10 of 15 for 144 yards against the Buccaneers on Thursday. He also led the Jaguars to their only touchdown of the game. However, Allen did all that against Tampa Bay’s third-string defense. With the quarterback competition opening up with only two preseason games left, it may be too late for Allen to move ahead of both Bortles and Henne. Of course, the elephant in the room is Colin Kaepernick, who remains unsigned by any NFL team. A couple of teams have kicked the tires on signing Kapernick, but no franchise has been willing to step up and sign him. With Bortles struggling this preseason and Henne little more than a career backup, Jacksonville could be the perfect spot for Kaepernick. But there’s nothing to indicate the Jaguars are considering signing him at this time. If Kaepernick, or any other quarterback from outside the organization, isn’t brought into the competition, the Jaguars are left to decide between Bortles and Henne. As the incumbent, Bortles may still be looked at as the favorite. But it’s obvious that Marrone is unhappy, and if Bortles can’t show improvement in the final two preseason games, Henne could end up being the Week 1 starter.